Not too long ago I encountered some Americans in the Eastern section of the New Age book store and we began chatting. I asked if they were Hindu, and one responded with “I am not in a religion but I am spiritual.” He spoke about his meditation practice and how it made him more calm. His friend told me how she is trying to get him into yoga. I helped her a bit by saying how I enjoy it and scores of other men. 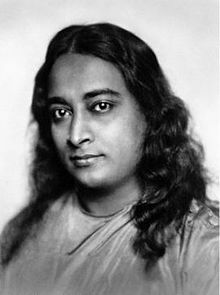 Paramahansa Yogananda who introduced millions of westerners to the teachings of meditation and Kriya Yoga through his book, Autobiography of a Yogi. I have since encountered others who seemingly practice Hinduism but they don’t define it as such. These folks practice yoga for more than exercise, do mantras, affirmations, meditate and use prayer beads. Yet they deny the fact that they are following a religion. After speaking with one fellow who regularly does most of the above, I asked him had he ever considered Hinduism. He gave me a strange look and said he really didn’t know anything about it. I explained to him that the things he practices are aspects of Hinduism. He was clearly interested in learning more and he asked me why Hindus didn’t “advertise”. Advertise. Interesting choice of words, since one function of advertising is to inform whereas proselytizing aims to actually convert. The major principle of Hinduism however is that there is only one truth. Yet the path to discover that truth may vary between individuals. In other words, there is no need to proselytize since we are all Hindus anyway, just at varying degrees of awareness. That acceptance and tolerance towards all is one of the main reasons that Hinduism has remained strong throughout the centuries. Such amiability, has helped it stay flexible and open to new ideas and concepts. Ironically, It is a very fertile ground to assail for more dogmatic religions. Christians for instance feel that to convert another is to do them a favor. It is giving them the gift of eternal life in Heaven as opposed to the everlasting fires of Hell. I really didn’t know how to respond to the man other than to explain the aforementioned reasons. He really did seem interested and I showed him some books that would explain it better than I. Actually, though some claim otherwise, it isn’t true that Hinduism has never been proselytized. Three rather well-known emissaries brought us Westerners Eastern enlightenment. The earliest Hindu missionaries to the West were arguably the most impressive. 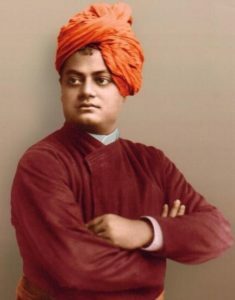 In 1893 Swami Vivekananda (1863–1902), a young disciple of the celebrated Hindu “avatar” (manifestation of God) Sri Ramakrishna (1836–1886), spoke at the World’s Parliament of Religions in Chicago and won an enthusiastic American following with his genteel manner and erudite presentation. Over the next few years, he inaugurated the first Eastern religious movement in America: the Vedanta Societies of various cities, independent of one another but under the spiritual leadership of the Ramakrishna Order in India. Another Hindu “missionary” who emerged during “recent” times may be better known to some US devotees is A.C. Bhaktivedanta Swami Prabhupada. Born as Abhay Charan De. in Calcutta, India. Swami Prabhupada, brought ISKCON to The US. He was asked by Srila Bha ktisiddhanta a leader in the Gaudiya Vaishnava community, a monotheistic tradition within the broader Hindu culture to bring the teachings of Lord Krishna to the English-speaking world. 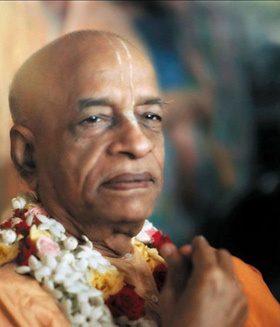 In July of 1966, he established the International Society for Krishna Consciousness (ISKCON) for the purpose he stated of “checking the imbalance of values in the world and working for real unity and peace”. In the eleven years that followed, Srila Prabhupada circled the globe 14 times on lecture tours spreading the teachings of Lord Krishna. Men and women from all backgrounds and walks of life accepted his message. With their help, Srila Prabhupada established temples, farm communities, a publishing house, and educational institutions around the world. And, he began what has now become the world’s largest vegetarian food relief program, Hare Krishna Food for Life. Unfortunately, ISKCON was mismanaged after Srila Prabhupada’s death but after a few turbulent years they have gotten back on track and have attracted many US born devotees. Between the ISKCON, SRF and Vedanta Societies there are many people in the US whose worship includes varying degrees of Hinduism. From all indications however, at no time did they ever use force, bribery or other deceitful maneuvers to grow their following. They simply disseminated to a worldwide audience the teachings on India’s ancient science and philosophy of Yoga and its time-honored tradition of meditation. People wanted to learn more, they gravitated to this knowledge and because the message had substance, it resonated with them and they willingly embraced it. Christians in India are oft times aggressive and relentless in their conversion practices and have been known to resort to chicanery and deceit in order to “save the misguided”. Why then don’t Hindus convert more aggressively? I don’t suggest that they employ the same underhanded tactics used by their Christian counterparts, but claiming what is theirs would seemingly be only fair. The US landscape is ripe for instruction and many, like the young man I met in the store actually practice aspects of Hinduism and don’t even realize it. I found my way to Sanata Dharma through wanting to know more about the roots of yoga and I have since met others, one fellow who attends the same temple as I. I don’t think it is a big stretch to evangelize to Americans, especially since many of us already meditate, do yoga postures, believe in reincarnation, karma, and see God as an impersonal being who is immanent and transcendent. The Vedas are the ultimate authority, Everyone should strive to achieve dharma, Individual souls are immortal and the goal of each individual soul is Moksha. On a more personal level doing daily puja, mantras, temple worship, cultivating good karma and the paths and limbs of yoga. For millennia the teachings and the richness of Hinduism were confined within the borders of India. Today, many in the West gravitate to its peace and serenity. Some without even knowing. Such a rich spiritual heritage should be shared as much as possible. The interest is there, the spiritual infrastructure having been laid. All that is needed is for Hindus to claim their own. Claim and explain. Some of the practices have been diluted to the point of bare recognition. Yoga for instance. Many think it actually originated from Buddhism! Hinduism proves that one does not have to force their beliefs onto others. Just let them see the effects, and they will willingly embrace it. Let’s just make sure they know from whence it came. When the word “Conversion” is used, almost everyone thinks of conversion in the Abrahamic sense, i.e closeting, restricting, limiting one’s quest into a small set of god-given ideals which must be believed in. Hindu mindset doesn’t like being limited (Arjuna did not believe Krishna by default, he questioned him thoroughly). Hindus are bit confused(about conversion) and even reluctant to spread their religion (They think it is kind of brainwashing). They will have to rethink their position given how ripe the world is for Hindu philosophy. I agree there is need to make people informed what Hinduism is about, There is a lot Hindus can do to invite people to Hinduism without forcing them or boring them in anyway. Even simple distribution of Gita, Upanishads would help. May i mention that followers of Sanathana Dharma never saw it as a religion to belong to. It was simply a Way of Life. Early followers of the Sanathana Dharma simply did not know any other way to be. It was natural to them. Just like breathing. Your picture of Vivekananda describes him as Sri Ramakrishna: best correct that! Corrected! Thanks so much for your astute observation! Hinduism doesn’t convert people because God is personal concept and it should not be forced on to other no matter how good it is for them. They need to find it them self like you did. This is the reason why it should be personal choice and not the choice of others. Harry, I am not suggesting that people force Hinduism on anyone, but just to let people know that some of the things they already are Hindu. IE yoga asanas. My personal philosophy is not to force my religion on anyone but just to manifest it in your life and they will seek it for themselves. Previous PostPrevious No Idols Here…. Next PostNext The temple….who needs it?